We've had an awesome week of butterflies. I've seen so many varieties and increased numbers of butterflies. The Eastern Tiger Swallowtail Butterflies have been the most numerous. They have been all over our huge white butterfly bush (I hear white is the best color for butterflies). We have 5 different colors of butterfly bushes and the white one commands the most visits. I took a couple of videos. One of a rare visitor, the Black Swallowtail Butterfly on Purple Verbena and one of the big yellow and black Eastern Tiger Swallowtails all over the white butterfly bush. Take notice on both of them the intricate design of their actual body. Our God is such a great designer! I've tried to take photos of spider webs so many times and they just don't do justice to what you see with your eyes. 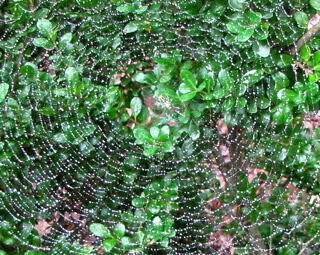 There's probably an art to the task, but one day after a rainstorm I was blessed to notice that there were many spider webs around the garden and with the water droplets on them, they really were showing themselves off. This is one of the pictures I took of a spider and web that was on our Compacta Holly Bush. I photographed a few more webs. Click on "View Enlarged Image" under the photo and then click on the arrows forward or back to see them. I have become fascinated with spiders and am amazed at the variety of designs that can't be seen with the naked eye. It's only when I take a macro shot and then look at it on the computer that I can see the amazing details of so many different types. View more spider photos. It's beyond my human mind to conceive the creativity of our Heavenly Father to create all these creatures with each one being unique ... just like you and I are totally unique, designed by Him. I've been seeing more baby birds as they so enjoy squealing from a bush or tree limb waiting on the parents to feed them as if they haven't eaten for days. We've got big babies and small babies and as I am writing this the Bluejays are screaming "faster, faster" to the parents trying to keep them fed. They're sitting on top of the feeder with food 4 inches beneath them. A few days ago while I was having my chaise time with God on the screened porch, I heard a Wood Thrush in the forest behind us. Their sound is so melodic and enchanting. It has an echo quality within the forest. They are beautiful birds with a bright white breast dotted with brown spots. The male sings his flute-like song to attract a mate for breeding. They are very reclusive birds that visit the deciduous forests of the eastern U.S. in summer scrambling around on the ground for bugs. They winter over in Central America. 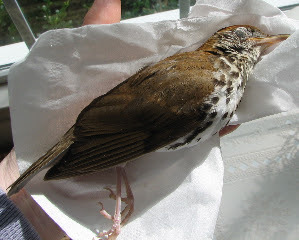 The best photo I have of a Wood Thrush is one that died in my hand. We were driving along a street in a rural neighborhood and I saw the struggling bird along the side of the road, obviously having hit a windshield or car. We stopped so I could pick it up to get it to the wildlife rehabilitation center, but it died in my hands within a few minutes. So sad. We took it home, took a few photographs and buried it in our wildlife burial area of our property and put a marker on the grave. That was in June of 2007. I ponder the verse Psalm 145:16 that says "God opens His hand and satisfies the desire of every living thing." Of course, I would like that to mean that no animal gets hurt and lives forever. The Hebrew word "satisfies" actually means: to be satisfied with, be fulfilled, to have enough. Looking at it that way helps me to see that my view of satisfy is certainly not God's view. But that's not such a surprise since when we try to analyze the things of God with our human minds, we don't see the big picture. Life and death are part of life, even though the devil tries to take us out a lot sooner than we are meant to go. 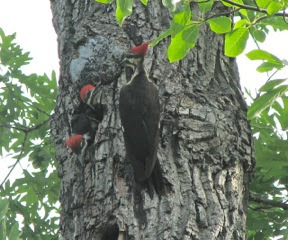 A happier story is that we saw two young pileated woodpeckers one evening last week on a tree by the screened porch. They flew onto a tree with a parent and then flew off in only seconds. Obviously following the parent to be sure for another feeding. They are so funny when they're young, being such huge birds even then, and acting like spoiled children. I didn't get a photo of them, but a few years back there was a nest in a neighbor's tree and we had a great time watching them feed when the babes were old enough to hang out of the nest waiting for the food to arrive. This photo is one of the mother feeding. It's amazing that they put their long beaks far into those throats. You can view more photos of this wonderful nesting next door at the album. There's a male and a female nestling. The male has the red on the side of his face. Begin here and click arrow to the right. Randal does his exercise routine three times a week in the garage with weights and always has the garage door up for the fresh air and to back out the car so he has space. The day after he was out there for a tool and saw a stranded hummingbird. It must have flew in the day before. How sad! He scooped it up on a broom and came to the door with an often heard phrase, "Get your camera." 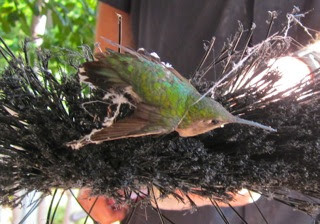 I grabbed it and came out to the porch to find a hummingbird stuck to the bottom of the broom by a bunch of cobwebs. I took two quick shots and got busy taking the spider webs off without grabbing him to produce the least trauma possible for this surely weakened bird. After getting off what I saw on top and along the side, I offered him some food from the feeder that sits on the front porch table. She was more interested in getting away, but when she tried to fly, she only fluttered down to the porch. It was obvious she still had some webs somewhere so I picked her up and could see them tangled about her tiny feet and tail, so when I cleared the rest of that off, she went flying to a nearby branch. We quickly left the scene so she could come back to feed right away. I call it a she since it did not have the ruby-throat of the male, but it could've been a juvenile also since it didn't seem that the feather were all totally filled in. See the enlarged image to see what I mean. I wondered how long she had flown about the garage trying to be free. All those windows that showed the sun and flowers filled with nectar and trapped inside unable to get through that clear glass to the view and garden beyond. When did it simply go to sleep to conserve fuel? Before its natural time at dusk or worn out from trying to escape this sudden prison, it may have known to rest in the hope of something greater. We are often like that bird. Trapped in some circumstance of life after having flown about thinking we had everything under control and then suddenly we find ourselves imprisoned by our thoughts and attempts to control our lives. Christ tells us, "Come unto Me, all ye that labour and are heavy laden, and I will give you rest" (Matt. 11:28). He will take our burdens and we can let Him work in our lives as we rest in Him, knowing and trusting that Someone greater can get us back to feeding on the sweet nectar of life that is available through knowing and loving our risen Savior. There was a tiny little "bee" flying around the Blue-Black Salvias in the front yard and when it rested on a flower I decided to get some photos. It was only about 1/4" long so I didn't expect much. When viewing the photo in an enlarged format, I was surprised to find the unusual design on its abdomen and also the huge red eyes that took up most of the face. 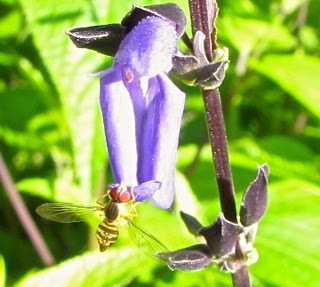 When I got my field guides out to identify it, I found out it was a Toxomerus Hover Fly. It's part of a family known as "flower flies." The coloring and movements mimic bees or wasps, but they don't bite or sting. They're considered very beneficial to keep aphid populations under control since the larvae eat them. Since we have lots of ladybug larvae we don't have an aphid problem, but I'm sure there's enough to share with these guys. This is an adult stage of the fly so it must've been well fed. View photos of ladybug larvae so you don't destroy them in your own garden. Flower Flies ... what a lovely name for a fly. Especially when we tend to consider flies unappealing. It's incredible how God has made so many things beautiful. As with people, we should not judge just based on a glance. It's so easy to do. We may take something someone says in a manner that was not intended and then it won't take long to realize that our minds have readily judged the person when we have never met them before, and certainly know nothing about them. How wonderful Jesus was to be so accepting of everybody, other than the religious people of His day who spent their lives judging others. I guess that's a great picture of the Scripture that says, "Judge not, that ye be not judged. For with what judgment ye judge, ye shall be judged: and with what measure ye mete, it shall be measured to you again" (Matt. 7:1-2). The Pharisees and Sadducees certainly attracted much judgment from our Lord as they remained wrapped up in the Law and outward appearances, rather than examining their own hearts and seeing their Messiah in the flesh. Many years ago, Randal and I saw a saying on a piece of wood that said, "Always Kiss Me Goodnight." We liked it but have never bought anything to hang above the bed with that saying on it. When we would get settled in bed before the light went out, I would look up at the wall like I was reading it. A sweet bedtime ritual. Recently, I found a great online deal on this decal. Randal and I had always liked this phrase and they have signs that are usually hung above a bed, but since our headboard is rounded, I never liked the idea of a straight board sign being there. I wanted something that would adapt to the curve. I've seen this saying in decals before for around $40 which I thought was ridiculous. When I saw this deal for $10 including shipping I grabbed it. However, sometimes the saying, "You get what you pay for" does apply. I took a photo after applying it and by that evening the letters were beginning to loosen up. I don't know what I could've done wrong in applying it so I can only assume that it's just not great quality. The A on 'always' is now somewhere on the floor behind the headboard. So now before the light goes off, we say, "L-ways Kiss Me Goodnight" and laugh a bit. I am glad I gave it a try though. 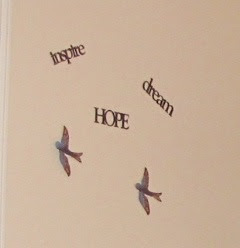 I have a real passion for words and really enjoying seeing them on walls, so I have considered these decals for a long time. There may be a difference in others ... but I don't think I'll try any more. Anybody purchased something similar? I rather like the words made from metal that you can arrange in a variety of ways. I like them very thin so you can hang them with a straight pin, but they seem to be very hard to find. When I was spending my days in bed last year with the heart issues, I was glad to have these words before me. 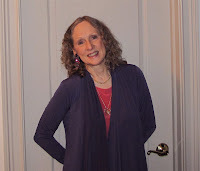 I'm on my third 21-day brain detox with Dr. Caroline Leaf's program. I'm loving it. I can't even put into words how this has brought roots up from my data banks and how the process is literally renewing my mind on the issues the Holy Spirit shows me. Science catches up with God. And fortunately, Dr. Leaf has a gift of breaking down the complicated terminology of the brain into everyday language. It's also a scientific fact that we can control our emotions and thoughts - "Casting down imaginations, and every high thing that exalts itself against the knowledge of God, and bringing into captivity every thought to the obedience of Christ" (2 Corinthians 10:5) and that we can renew our minds - "Do not conform to the pattern of this world, but be transformed by the renewing of your mind" (Romans 12:2). God never tells us to do anything we can't do. We may choose to say we don't understand the Bible, but it all comes down to whether or not we believe the Word and are willing to seek revelation from the Holy Ghost on what we don't understand. God gave us His Word so we would communicate with Him and learn of Him. "All scripture is given by inspiration of God, and is profitable for doctrine, for reproof, for correction, for instruction in righteousness: that the man of God may be perfect, throughly furnished unto all good works" (2 Tim. 3:16-17). Until next issue .... get in The Word! P.S. Know somebody who needs to see something in this newsletter? Share this link with them!